How do galaxies grow? To help find out, the Hubble Space Telescope was deployed to image the unusual elliptical galaxy PGC 42871. How this galaxy came to be surrounded by numerous shells of stars may give clues about how it evolved. Embedded in the diffuse shells are massive globular clusters of stars — stars which analyses show were born during three different epochs. This and other data indicate that PGC 42871 has been in at least two galactic collisions, at least one of which might have been with a former spiral galaxy. The remaining spiral galaxy on the far left is at the same distance as PGC 42871 and may have been involved in some of the collisions. PGC 42871 spans about 20 thousand light years and lies about 270 million light years away toward the constellation of Centaurus. The best known asterism in northern skies hangs over the Canadian Rockies in this mountain and night skyscape taken last week from Banff National Park. But most remarkable is the amazing greenish airglow. With airglow visible to the eye, but not in color, the scene was captured in two exposures with a single camera, one exposure made while tracking the stars and one fixed to a tripod. Airglow emission is predominately from atmospheric oxygen atoms at extremely low densities. Commonly recorded in color by sensitive digital cameras the eerie, diffuse light is seen here in waves across the northern night. 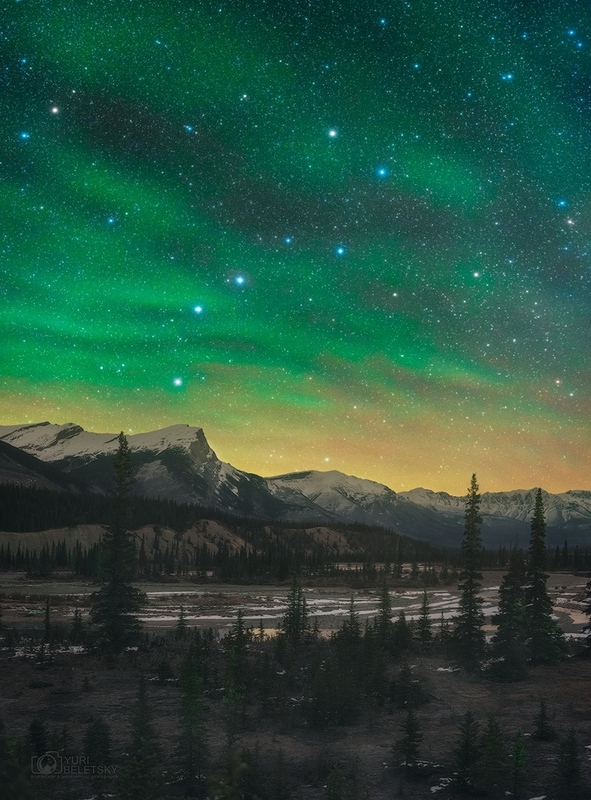 Originating at an altitude similar to aurorae, the luminous airglow is due to chemiluminescence, the production of light through chemical excitation and radiative decay. Energy for the chemical excitation is provided during daytime by the Sun’s extreme ultraviolet radiation. Unlike aurorae which are limited to high latitudes, airglow can be found around the globe. How did galaxies form in the early universe? To help find out, astronomers surveyed a patch of dark night sky with the Very Large Telescope array in Chile to find and count galaxies that formed when our universe was very young. Analysis of the distribution of some distant galaxies (redshifts near 2.5) found an enormous conglomeration of galaxies that spanned 300 million light years and contained about 5,000 times the mass of our Milky Way Galaxy. 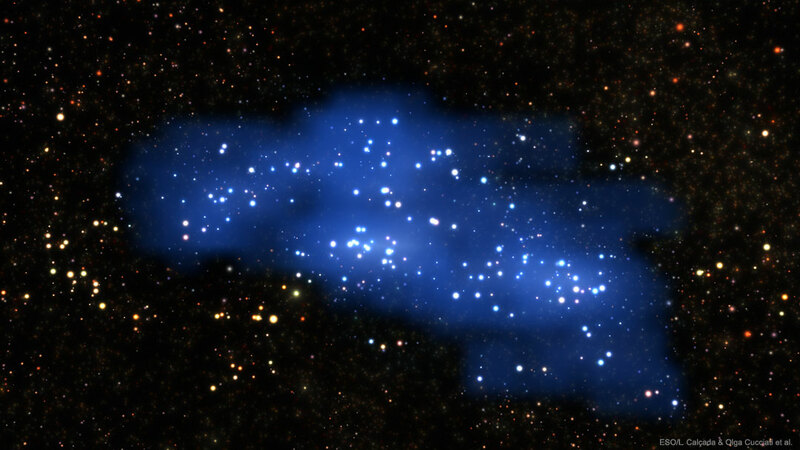 Dubbed Hyperion, it is currently the largest and most massive proto-supercluster yet discovered in the early universe. A proto-supercluster is a group of young galaxies that is gravitationally collapsing to create a supercluster, which itself a group of several galaxy clusters, which itself is a group of hundreds of galaxies, which itself is a group of billions of stars. In the featured visualization, massive galaxies are depicted in white, while regions containing a large amount of smaller galaxies are shaded blue. Identifying and understanding such large groups of early galaxies contributes to humanity’s understanding of the composition and evolution of the universe as a whole. 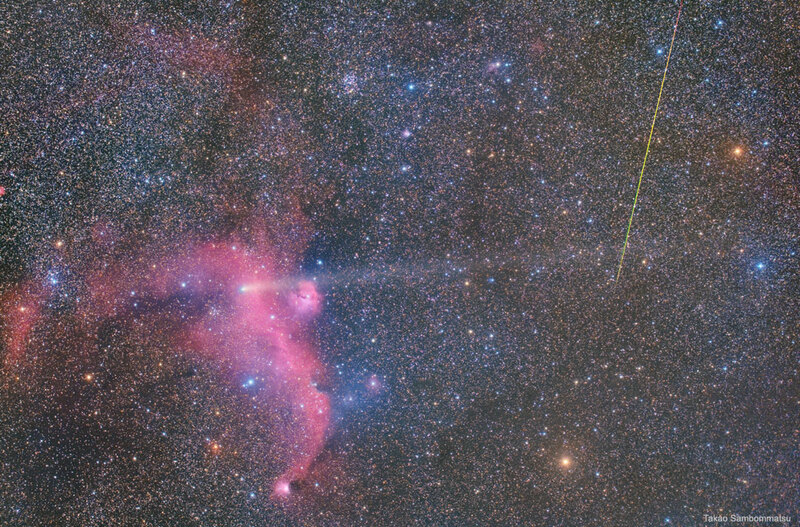 A meteor, a comet, and a photogenic nebula have all been captured in this single image. The closest and most fleeting is the streaking meteor on the upper right — it was visible for less than a second. The meteor, which disintegrated in Earth’s atmosphere, was likely a small bit of debris from the nucleus of Comet 21P/Giacobini-Zinner, coincidentally the comet captured in the same image. Comet 21P, pictured across the inner Solar System from Earth, is distinctive for its long dust tail spread horizontally across the image center. This comet has been visible with binoculars for the past few months but is now fading as it heads back out to the orbit of Jupiter. 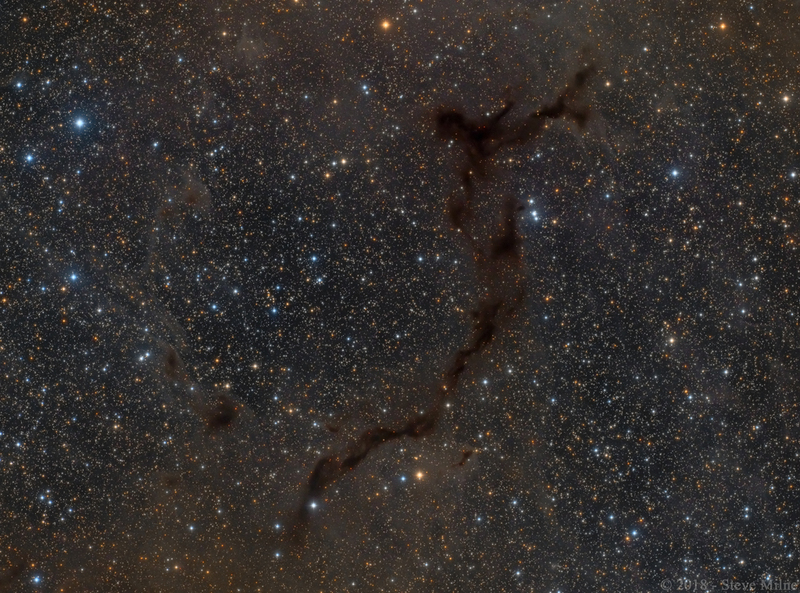 Farthest out at 3,500 light years distant is the IC 2177, the Seagull Nebula, visible on the left. The comparatively vast Seagull Nebula, with a wingspan on order 250 light-years, will likely remain visible for hundreds of thousands of years. Long exposures, taken about two weeks ago from Iwaki-City in Japan, were combined to capture the image’s faintest elements. You, too, could see a meteor like this — and perhaps sooner than you might think: tonight is the peak of the Orionids meteor shower. Not a Falcon 9 rocket launch after sunset, the Cat’s Eye Nebula (NGC 6543) is one of the best known planetary nebulae in the sky. 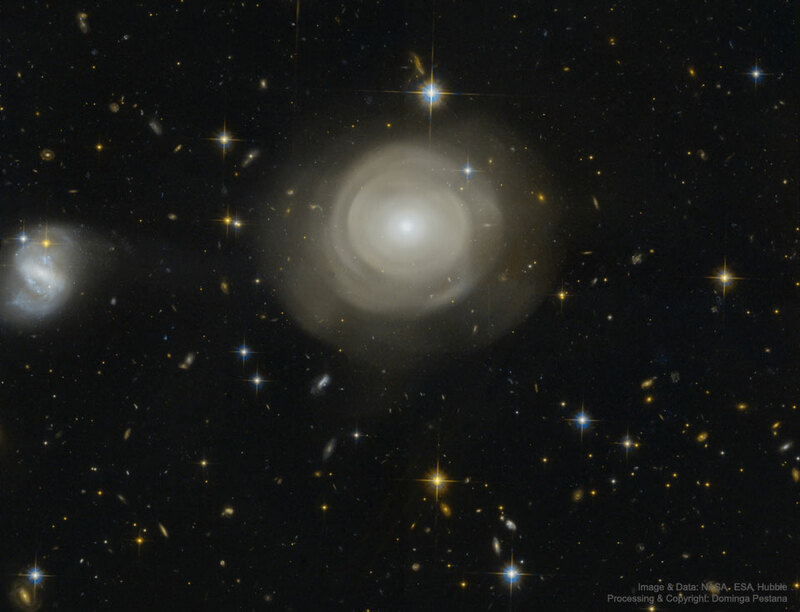 Its haunting symmetries are seen in the very central region of this composited picture, processed to reveal an enormous but extremely faint halo of gaseous material, over three light-years across. Made with data from ground- and space-based telescopes it shows the extended emission which surrounds the brighter, familiar planetary nebula. 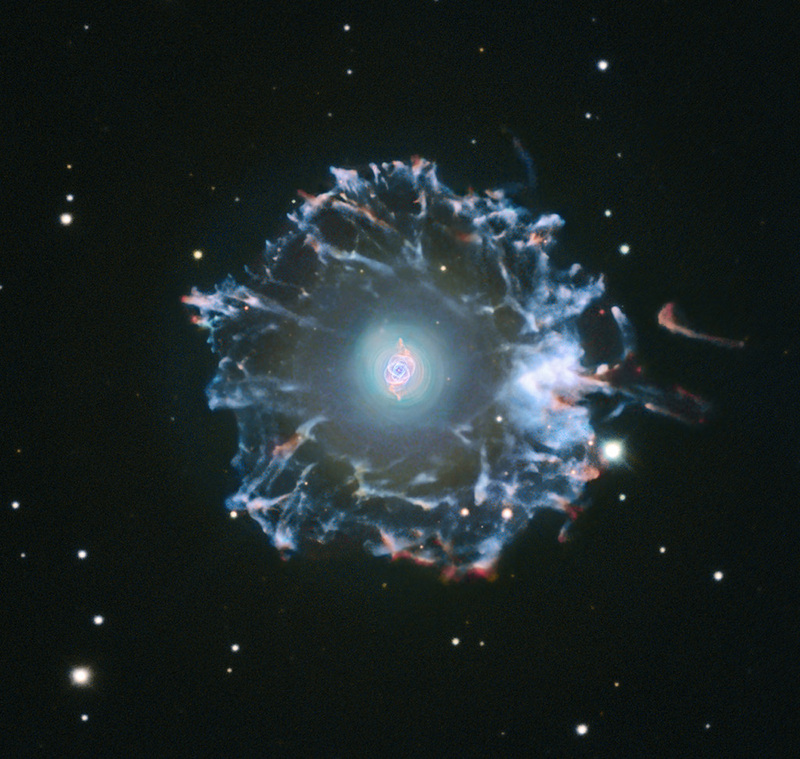 Planetary nebulae have long been appreciated as a final phase in the life of a sun-like star. But only more recently have some planetaries been found to have halos like this one, likely formed of material shrugged off during earlier active episodes in the star’s evolution. While the planetary nebula phase is thought to last for around 10,000 years, astronomers estimate the outer filamentary portions of this halo to be 50,000 to 90,000 years old. 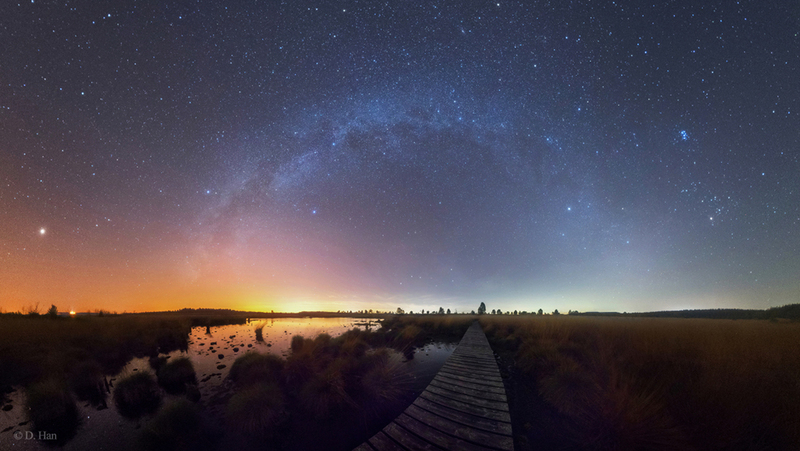 Taken near local midnight, this autumn night’s panorama follows the arch of the Milky Way across the northern horizon from the High Fens, Eifel Nature Park at the border of Belgium and Germany. Shift your gaze across the wetlands from west to east (left to right) and you can watch stars once more prominent in northern summer give way to those that will soon dominate northern winter nights. Setting, wanderer Mars is brightest at the far left, still shinning against almost overwhelming city lights along the southwestern horizon. Bright stars Altair, Deneb, and Vega form the northern sky’s summer triangle, straddling the Milky Way left of center. Part of the winter hexagon Capella and Aldebaran, along with the beautiful Pleiades star cluster shine across the northeastern sky. The line-of-sight along the hikers boardwalk leads almost directly toward the Big Dipper, an all season asterism from these northern latitudes. Follow the Big Dipper’s pointer stars to Polaris and the north celestial pole nearly centered above it. Andromeda, the other large galaxy in the skyscape, is near the top of the frame.